Name a commodity that won’t fit in or on a trailer and we’ll show you an over-dimensional and extra-heavy load. And even many of those would be accommodated by some of the trailers offered by specialty builders around the country. Bread-and-butter loads – literally or figuratively – are carried by vans and reefers that account for the big majority of the trailer population on roads and in the yards of terminals and shipping points. 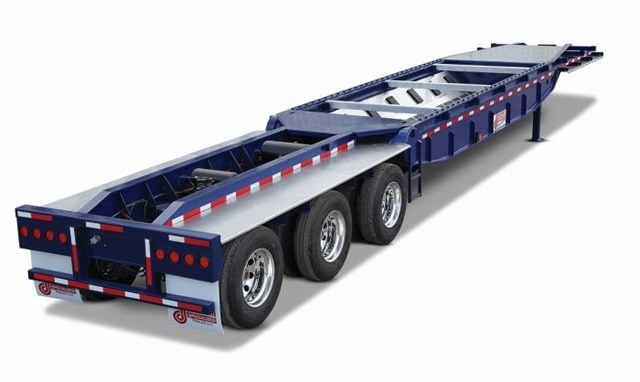 A common goal among manufacturers of various trailer types is constant improvement through weight reduction, increased durability and lower maintenance, and greater hauling efficiency. Those that sell nationally or throughout North America often display their wares at big industry events like the Mid-America Trucking Show in Louisville, Ky., and the American Trucking Associations Technology & Maintenance Council’s Equipment Expo, staged as part of the group’s annual meeting in Nashville. That’s where we see many new trailer products. Other builders announce their latest offerings throughout the year. 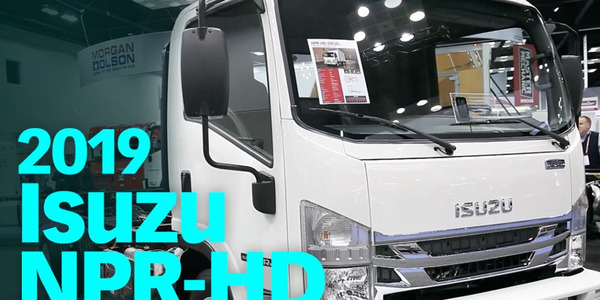 The much talked-about absence of truck builders from this year’s Mid-America show, while disappointing to some attendees, benefited other exhibitors, including trailer manufacturers. It enabled some to expand their booths and display more vehicles, and allowed exhibitors who sat outside in former years to move indoors. Several commented that they saw more traffic and serious questions from people who’d otherwise would’ve breezed by or paused only to kick the proverbial tires. Following is a summary of some of the products we learned about at the shows and through contact with manufacturers. Doonan announced a Black Gold Coil Hauler trailer built to carry steel coils “shotgun style,” where the eye of the coil is facing forward, securely recessed inside a well. As Mike Gordy, co-manager for operations, noted, “Coils can pack a punch if they get loose.” Its center well opening is 19 feet long by 76 inches wide, with recessed concave beams to safely secure a load. The trailer is rated at 98,000 pounds gross when axles are equipped with disc brakes, so it can handle a coil weighing 60,000 pounds or more. Nine custom pockets are arrayed along the sides to support stakes for tarps. 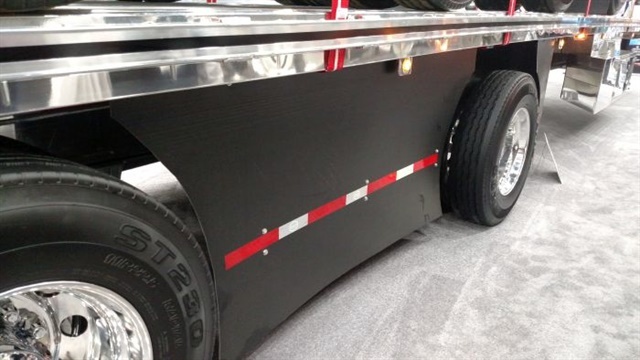 Among the trailers in East’s large booth at MATS was a new aluminum flatbed with an integrated side rail that takes a generic LL (also called a double-L) flat-hook on tie-down straps. 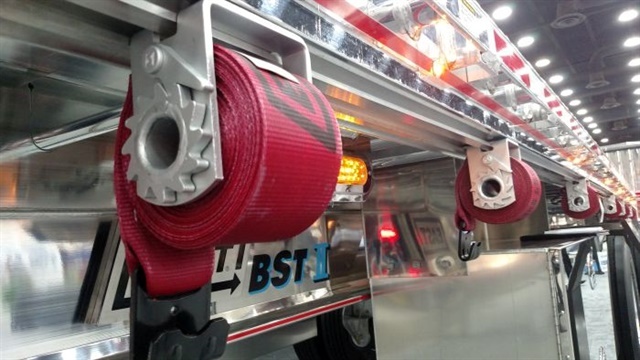 Dave de Poincy, president and chief operating officer, said that’s a benefit to customers because East flats traditionally have needed brand-specific winches, but the new side rail will allow use of common winches for tie-downs. 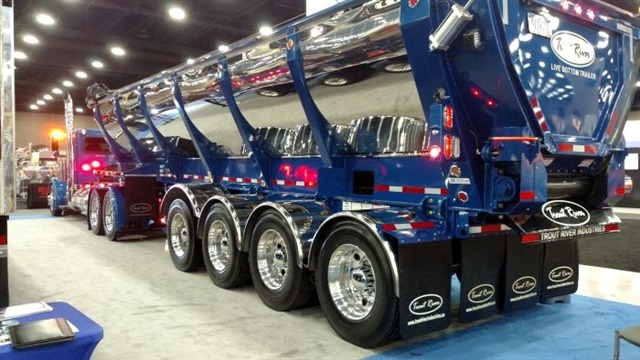 East also showed several of its popular smooth-sided Genesis dump trailers, in configurations and lengths for handling various commodities in different states. 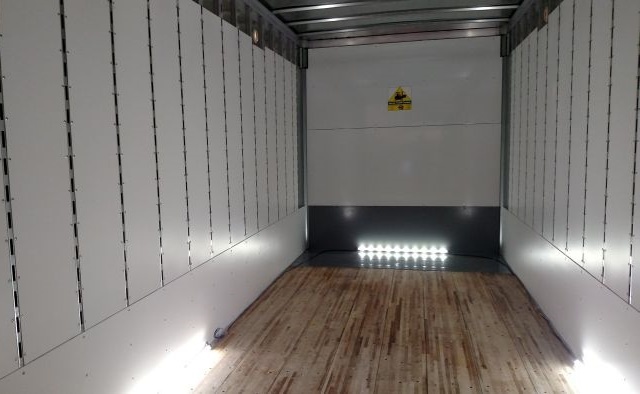 At TMC’s Equipment Expo, Great Dane showed a Champion SE 28-foot sheet-and-post pup trailer whose interior had floor-level LED lighting and PunctureGuard liners. The LEDs burned with a cool but bright-white intensity and reflected off the lightweight thermoplastic liners. The liners will take repeated bashings from a hammer (not too likely) or forklift tangs (very likely), a sales rep proudly said. PunctureGuard’s material is also touted as highly resistant to delamination and as easy and quick to repair. 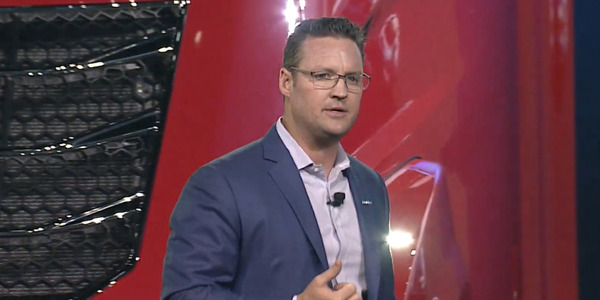 At MATS, Hyundai Translead had “the largest space in the show,” a 100 by 150-foot booth with 4,000 more square feet than in 2015’s show, said Brett Bartells, general manager for marketing and communications. 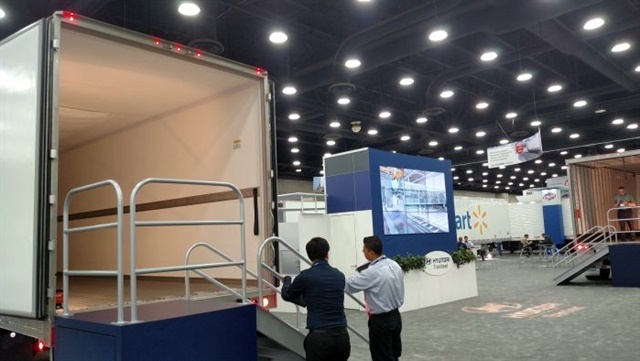 Even with eight units on display, there was plenty of room among them for show-goers to get good views of each vehicle: one reefer, two platforms, two 28-foot pups, a high-cube 53-foot sheet-and-post van, a converter dolly, and a composite-wall van. 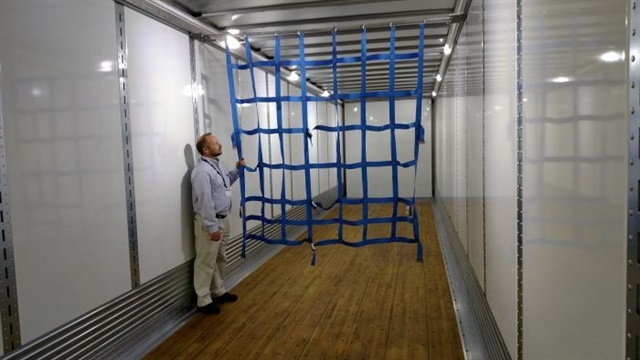 The composite van trailer was outfitted with LED interior lights and “rolling” cargo nets to segregate different cargo shipments. If Mac’s large MATS booth seemed crowded, it’s because it held 16 trailers, some stacked one atop another, and two dump truck bodies. Featured on a prominent side of its booth was a “Michigan special” pneumatic tanker with eight axles and six hopper compartments to haul sugar — 120,000 pounds of it, noted Kristi Rummel, marketing manager. She also pointed out a Classic aluminum flatbed with a bolted-on (instead of welded) rear impact guard, and an Air Flect skirt between its spread axles. She said the skirt has been tested and proven to increase fuel economy by 0.25 mpg at highway speeds. A gleaming 50th Anniversary Dark Wing aluminum flatbed graced Manac’s booth at MATS to celebrate the company’s founding in 1966 in Saint-Georges, Quebec (it’s still there, but now Manac also has two plants in Missouri). The trailer was tilted so its polished underbody parts could be viewed and admired. Keith Limback, the general sales manager, noted that the 48-footer’s main beams were honed to a fine shine, along with almost everything else. A fully closed rear end was trimmed with the anniversary logo, and of course the required tail/stop/signal lights and red-and-white reflective tape. 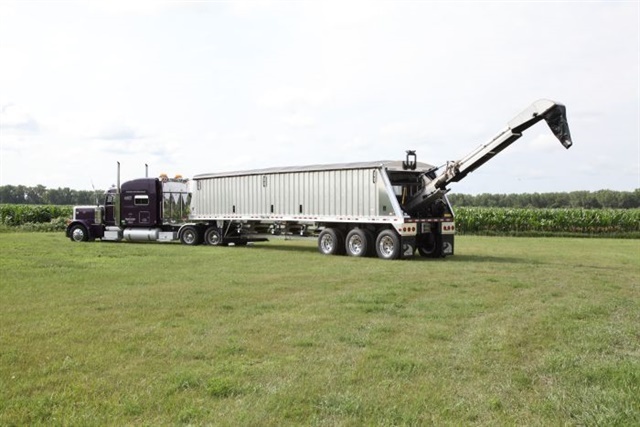 Polished or not, “flatbeds are dock-loaded more and more,” and equipped with sliding tarping systems and liftable axles, he said. 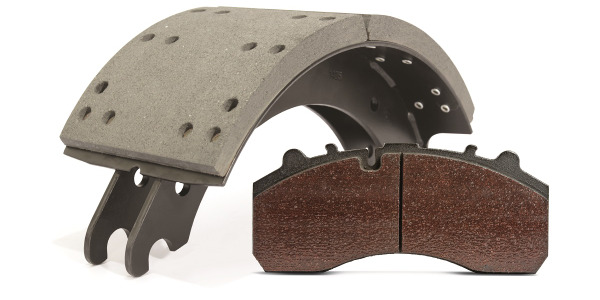 A tough and relatively easily worked steel called Hardox (a product of SSAB in Sweden) is increasingly used in dump bodies and trailers that haul abrasive materials like concrete, brick, asphalt or stone. One is Ox Bodies’ Trail Ox Scrap Trailer, a frameless dumper offered in lengths up to 40 feet, with side and end heights up to 72 inches. 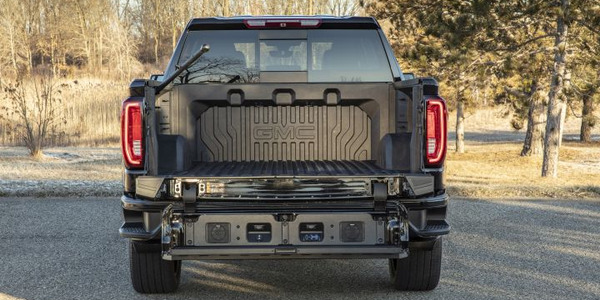 A swing-style tailgate is standard, and a variety of configurations and options are offered to meet specific hauling needs. Ox is part of TBEI, which also owns the Crysteel, Rugby, DuraClass and J-Craft brands. 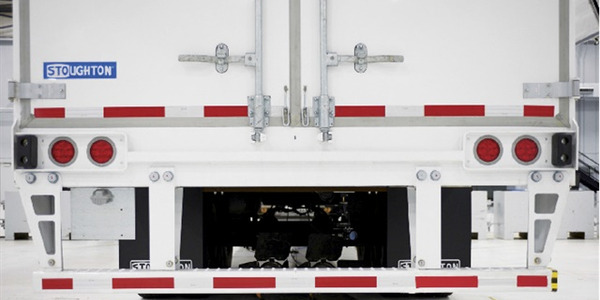 Stoughton announced last month that its engineers have developed a stronger and safer rear underride guard, and that it will be standard starting in the fourth quarter. 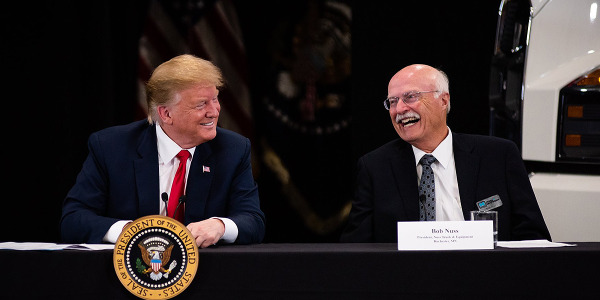 The guard exceeds American and Canadian standards for the sometimes controversial bumpers, said Bob Wahlin, Stoughton president and CEO. It’s based on recommendations from the Insurance Institute for Highway Safety, which is concerned about offset crashes where cars hit a guard right or left of center. The Stoughton guard holds up to those because it includes two additional bolt-on vertical supports on the outer ends of the horizontal bar. Those and the existing two supports are integrated into the bar and fastened to the undercarriage to strengthen the guard. The new underride guard adds no weight and does not affect aerodynamics, and will be available in painted carbon steel, galvanized steel or stainless steel. 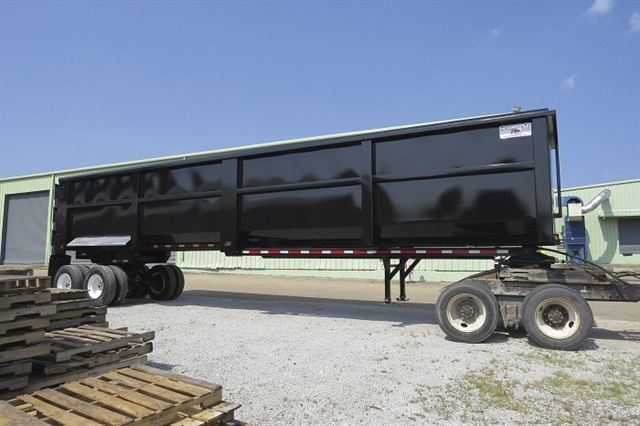 Trail King announced a conveyer-equipped hopper-bottom grain trailer. Rick Farris, vice president, sales and marketing, said the AHTC-model grain hauler, formerly a product of Dakota Trailers (which Trail King acquired last year), has a Convey-All belt-type apparatus that deposits loads into high storage silos and elevators. Another conveyor beneath the trailer’s hoppers can deposit grain into a below-ground pit or auger. The machinery is removable and stowable indoors or outdoors so the trailer can be used for normal hauls. 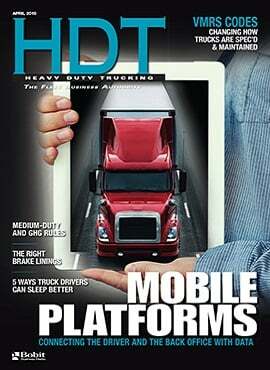 Talbert concentrates on multi-axle, many-wheeled heavy-haul trailers. 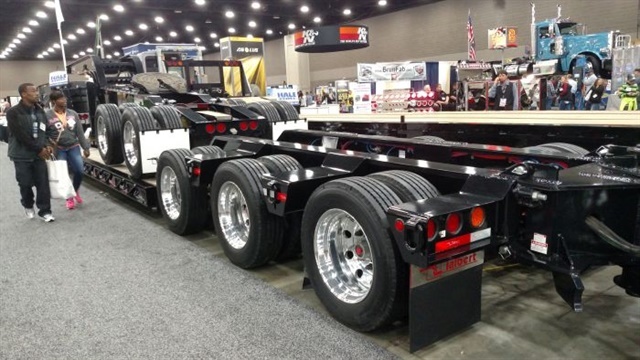 One shown at MATS was a 65SA, a 65-ton spread-axle model with three axles on 60-inch centers; it also had a flip-up two-axle rear section and a hydraulically detachable gooseneck sitting aboard a two-axle “jeep,” for a total of seven axles. Overall length was 94 feet, 3 inches. Customers always want lighter-weight trailers, and careful design and intelligent use of materials can achieve some savings. 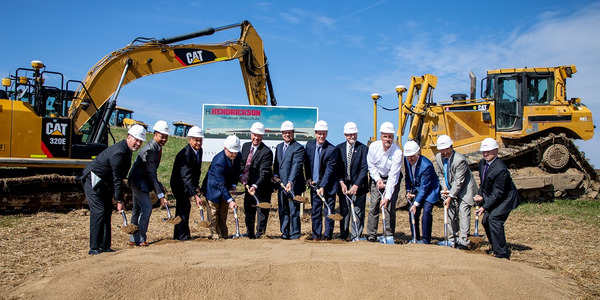 But, “loads are getting bigger, wider, heavier, so there comes a point where the word ‘integrity’ comes into play and we don’t want to interfere with that” by trying to cut too much weight, commented Troy Geisler, vice president of sales and marketing. 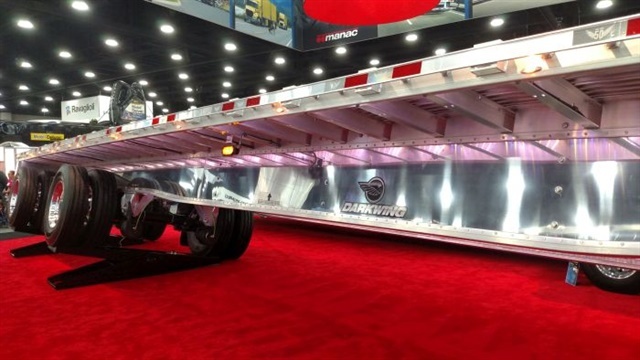 At MATS, Utility showed a “combo” steel-framed aluminum flatbed with an Arrow Conestoga sliding tarp, which completely opens to allow both side- and overhead loading and unloading. The Conestoga has joined a lineup that since the 1980s has included the soft-sided but fixed-roof Tautliner, a design that came from Europe. 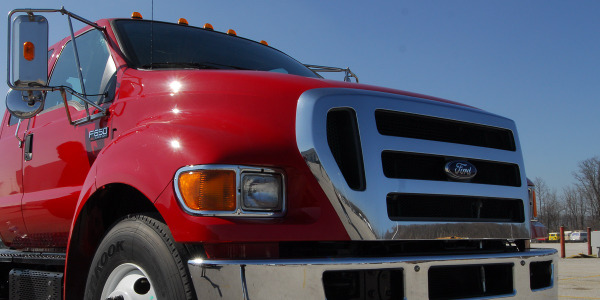 Utility sells about 200 of those covered flatbeds a year. Also featured was a prototype sheet-and-post van with a 30-inch-tall scuff plate designed to take beatings from forklifts. Larry Roland, director of marketing, said Utility’s S&P vans don’t see the “bulging” suffered by some plate-sided vans, but “some customers perceive that they need it.” The tall scuff plated van was in final testing and engineers were getting feedback from users. Trout River, from Prince Edward Island, Canada, attended MATS for the first time. Mathieu Gallant, the sales manager, brought a “Shuttle Floor” steel dump trailer with a belt-conveyor bottom. The powered belt is 39 inches wide and offloads aggregates or asphalt in just a few minutes while the trailer remains horizontal and stable. The company also makes a refuse version, which is an open-top van with a 94-inch-wide belt that can disgorge its load in 2 minutes. “We’ve become the new norm in waste hauling” to landfills, he said. 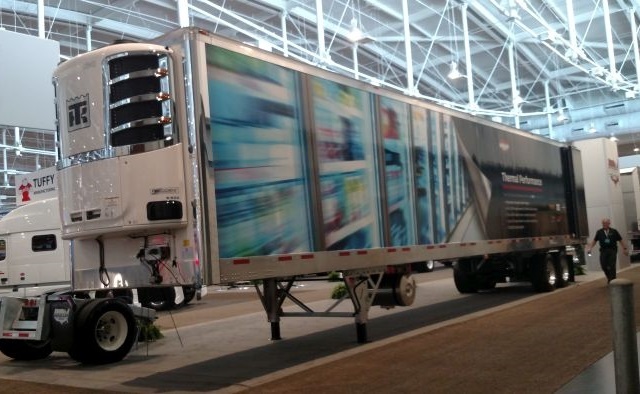 At the TMC expo, Wabash showed a prototype composite refrigerated van with very few bolts and no rivets. 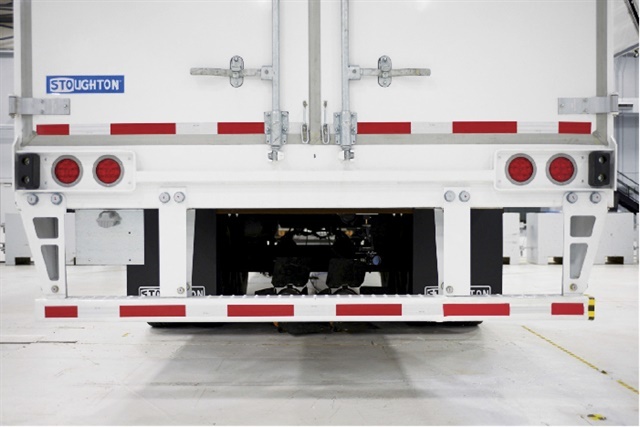 The trailer uses molded structural composites (MSCs), developed by Wabash engineers over the last three years, said Brent Yeagy, group president, Commercial Trailer Products. 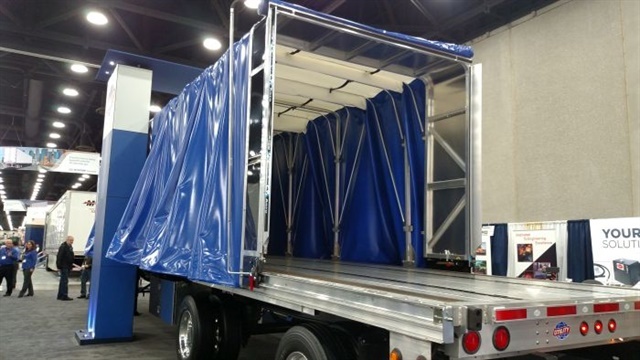 The material gives the 53-foot trailer up to 25% improvement in thermal performance and is up to 20% lighter compared to conventional designs, while interior puncture resistance is 25% better. An embossed, slip-resistant aluminum floor has a 24,000-pound rating, which is 50% more than a standard aluminum floor, he said. Its floor support comes completely from MSC components, so the vehicle has no metal crossmembers. This lowers the floor height and the vehicle’s center of gravity, and adds several inches of vertical interior room. 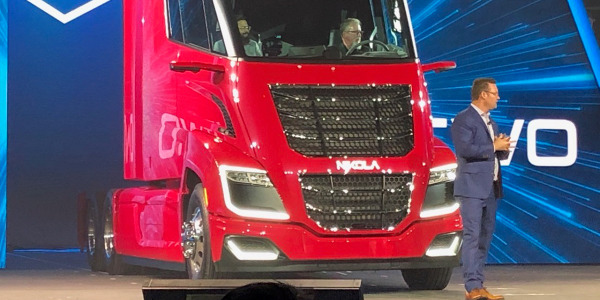 A truck body version is already in production. 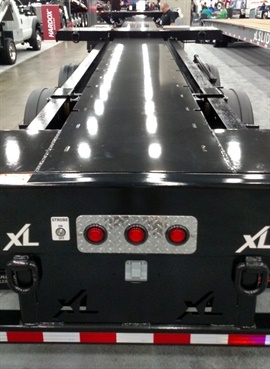 XL Specialized has XL 80 and XL 90 Hydraulic Detachable Extendable lowboys, with 80,000- and 90,000-pound capacities, whose main decks can stretch from 28 feet, 4 inches to 50 feet, 3 inches, with extension stops every 24 inches. Deck height is 18 inches. 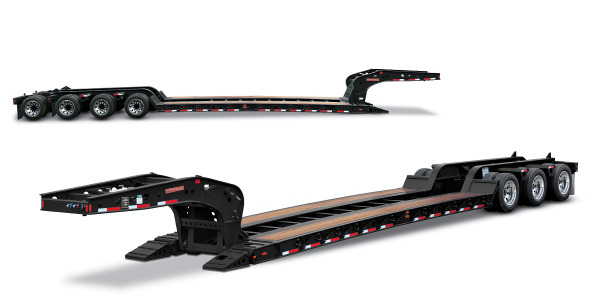 Normally 53 feet, 5 inches long, a trailer has a flip axle to help scale large loads and a 44-inch flip neck with kingpin settings at 16 inches and 24 inches, which together make the unit 84 feet long when extended. A detachable wheel area allows drivers to insert more decking.